In the exhibition hall, a space was provided allowing the participants to experience Korea through the Korean culture experience stage, and a K-Pop contest accompanied by life-size figures of artists. At the Main Stage, a wide range of events to enjoy Korean content were offered not only in terms of K-Pop Cover dances but also in terms of visual pleasure like a Hanbok Fashion show. 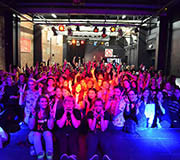 K-Pop Belgium Socity was established in 2014 and the activities are mainly held in Antwerp (Flemish region) and not in the capital city Brussels. 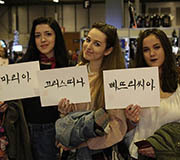 The Society, composed of local Hallyu fans is a leader in increasing awareness of Korea in connection with the Korean Cultural Center. An array of programs were provided, starting with "Try Hanbok" and covering traditional Korean games, Noraebang (Singing Room), Quiz, and Taekwondo. In particular, as for the traditional Korean game "ttakji-chigi (slap-match)", the process of making it and competing in the game were all included. Moreover, even the equipment of a Noraebang was installed, earning the greatest love from K-Pop fans. Eeoullim Band (hereafter, "Eeoullim") is a community established on May 5th, 2015, aiming to play Samulnori with company colleagues and teach it. Their aim is not only playing and teaching Samulnori, but also spreading Korean culture. Like the name "Eoullim", they pursue not only musical harmony but also essential values of life. Every Tuesday evening, they practice Samulnori at the Korean Cultural Center. Samulnori Class was held at the Korean Cultural Center in Poland. 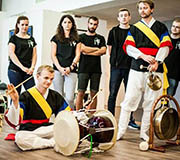 Though they are not professional musicians, they carefully explained Korean music Samulnori and history of each instrument to the local Polish people and even instructed them in playing the instruments. Lastly, the event ended when the public finished playing the music learned from the "teachers". It was too short a time to master in one day, but all participants are expecting the upcoming events. 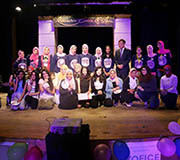 Sam Han Team (hereafter referred to as "Sam Han") was established in 2013 on the basis of Alexandria and has love for Korea as well as a clear objective, dream, and passion to promote Korea. The community name "Sam Han" refers to the three Kingdoms in Korean history "Mahan, Jinhan, Byeonhan" and it was picked up with the purpose of letting the Egyptians know of Korean culture and history. The main theme was set as K-Pop. K-Pop Dance, and a song contest was also held. Simultaneously, a special session of learning "cheering technique", which is a sort of the sole property of Korean singers, was provided.